So You Think kept his massive reputation intact at Leopardstown as he won the Red Mills Irish Champion Stakes after a terrific duel with Snow Fairy. Aidan O'Brien's strapping Australian import was sent on his way the 1-4 favourite under Seamie Heffernan and looked to have matters under control as he took over from stablemate Roderic O'Connor entering the straight. But the five-year-old had to work very hard to fend off the sustained challenge of the Ed Dunlop-trained Snow Fairy in the hands of Frankie Dettori and passed the post with just half a length to spare, with a further six lengths to Famous Name in third. The trainer said: "It's a long time since he ran, and you'd always be worried about that. We'll discuss things during the week now as to where he'll go next. He cruises through his races and all options are open to him. He's an incredible specimen of a thoroughbred." John Magnier, of the Coolmore operation, added: "He's a good horse, and she (Snow Fairy) is a very good filly, so it was a good race. "This horse's record is there for everyone to see. He's the kind of a horse who we are spoilt for choice with options. 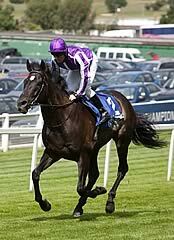 He could run in the mile race at Ascot (Queen Elizabeth II Stakes), the mile-and-a-quarter race (Qipco Champion Stakes, Ascot), or he could run in the Arc." Of a potential return to Australia, Magnier added: "You could never say never, but it's not imminent." Heffernan said: "He is getting more uncomplicated. He idled a bit in front and gave a blow. When you are on him, you are on the king of the road. "Settling him was going to be a bit of a problem but I was confident I could do that after the Eclipse. When he settles he'd go over any trip."